Central retinal vein occlusion (CRVO) blocks the main vein in the retina, the light-sensitive nerve layer at the back of the eye. The blockage causes the walls of the vein to leak blood and excess fluid into the retina. When this fluid collects in the macula (the area of the retina responsible for central vision), vision becomes blurry. “Floaters” in your vision are another symptom of CRVO. When retinal blood vessels are not working properly, the retina grows new fragile vessels that can bleed into the vitreous, the fluid that fills the center of the eye. Blood in the vitreous clumps and is seen as tiny dark spots, or floaters, in the field of vision. In severe cases of CRVO, the blocked vein causes painful pressure in the eye. 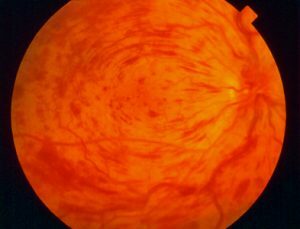 Retinal vein occlusions commonly occur with glaucoma, diabetes, age-related vascular disease, high blood pressure, and blood disorders. The first step of treatment is finding what is causing the vein blockage. There is no cure for CRVO. Your ophthalmologist may recommend a period of observation, since hemorrhages and excess fluid often subside on their own. Laser surgery may be effective in preventing further bleeding into the vitreous or for treating glaucoma, but it cannot remove a hemorrhage or cure glaucoma once it is present. New experimental treatments are now under investigation.